For today’s true feminists, Susan B. Anthony is a heroine. She was the force behind a woman’s right to vote and is considered one of the most influential women in history. Born in 1850, Anthony was a woman’s right activist and social reformer. She was born a Quaker and believed in social equality. At the age of 17, Anthony collected petitions against slavery and was appointed the American Anti-Slavery Society state agent for New York in 1856. In 1852, Anthony was barred from speaking at a temperance conference. She was barred because she was a woman. Infuriated, Anthony, along with her friend, Elizabeth Cady Stanton founded the Women’s State Temperance Society in New York. Anthony and Stanton also formed the Women’s Loyal National League in 1863 and used the League to help collect almost 400,000 signatures on a petition to abolish slavery. Anthony and Stanton formed the Equal Rights Association in 1863 and advocated for equal rights for both African Americans and women. Their newspaper, The Revolution was first published in 1868 and in 1869, these two women formed the National Woman Suffrage Association following a split in the women’s movement. By 1890, this rift was healed and the American Woman Suffrage Association and the National Woman Suffrage Association combined to create the new National American Woman Suffrage Association. Anthony was the driving force behind this merger. Anthony came to believe that no woman would be respected or taken seriously until they could vote. The vote would provide women with political leverage and eventually, her work resulted in women getting the right to vote when the Nineteenth Amendment was passed in 1920, 14 years after her death. 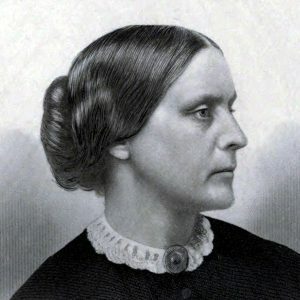 Susan B. Anthony is considered by most to be the first feminist in the United States. She attended her convention on women’s rights in 1852. She and Stanton believed women would be granted the right to vote by the Republicans as a reward for garnering the support of women for the Thirteenth Amendment. They were to be bitterly disappointed as Congress once again denied women this right. Anthony never gave up on her efforts for women’s suffrage. She traveled throughout the West and continued to campaign vigorously for the women’s rights. In 1872, Anthony along with her sisters and other women were arrested because they had voted. Along with the election inspectors accused of allowing her to vote, Anthony was arraigned and charged with voting in the Rochester Common Council chambers. Anthony refused to pay bail and was eventually indicted. Her attorney did pay her bail and asked for a change of venue. This was denied by the court who then instructred the jury to find Anthony guilty. She was fined $100 and courtroom fees. Anthony refused to pay, but the judge didn’t put her in jail and she lost her right to appeal the verdict. She met with President Theodore Roosevelt in 1898. He responded with that women’s suffrage was “not that important.” She continued to be an advocate and was quoted saying “Failure Is Impossible”. She died in 1906 from heart failure in her home in Rochester but her legacy continues.